The bright lighting outside made us feel parking was made extra safe. Where to find Mount Vernon hotels near an airport? How can I find hotels in different Mount Vernon neighborhoods? Where can I find hotels in Mount Vernon that are near tourist attractions? For those who are hoping to find a hotel or apartment close to Mount Vernon, there are a few options. You'll find 9 Expedia-listed hotels within easy driving distance of the downtown area. 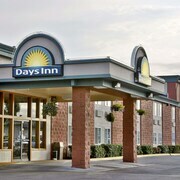 You will find Quality Inn and Best Western College Way Inn within walking distance from the center of Mount Vernon. 12 kilometres (8 miles) from the middle of Mount Vernon is the accommodation area of La Conner. This boasts 3 places to stay. Choose from a range of accommodation options including the Katy's Inn and La Conner Channel Lodge. Also popular with tourists is Burlington which is an alternative Mount Vernon accommodation district that is 6 kilometres (4 miles) from downtown Mount Vernon. Some of the popular Burlington accommodations include the Hampton Inn & Suites Burlington and Holiday Inn Express & Suites Burlington. The Quality Inn, Three Rivers Inn and Best Western College Way Inn are good accommodation options for vacationers who are after budget accommodation. The Inn At Barnum Point is situated 25 kilometres (17 miles) from the center of Mount Vernon. Alternatively, the Fairfield Inn & Suites by Marriott Burlington is positioned 10 kilometres (6 miles) away. 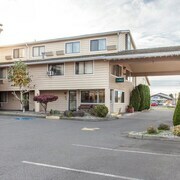 Some other Expedia-listed hotels are the Swinomish Casino & Lodge and the Candlewood Suites Burlington South. If you are inspired to see more of the forests and mountains that are typical in this region, you could also plan a few nights in other parts of Northwest Washington. Whether you engage in common local activities, such as skiing and cross-country skiing, or just travel around to see the sights you will be able to book comfortable places to stay in the area. 40 kilometres (24 miles) from Mount Vernon is Blaine, where you'll find the Western Washington University. Bellingham offers some great places to spend the night. Why not visit Blaine, which is home to the Birch Bay Waterslides. Blaine can be found 70 kilometres (44 miles) to the northwest of Mount Vernon. The Ocean Promenade Hotel and Pacific Inn Resort & Conference Centre are great places to stay. Bellingham International Airport is a nearby airport for flying in and out of Mount Vernon. It is 45 kilometres (28 miles) drive away. If you plan to stay nearby, try the Springhill Suites by Marriott Bellingham or Hampton Inn Bellingham-Airport. What are the most popular Mount Vernon hotels? Are there hotels in other cities near Mount Vernon? 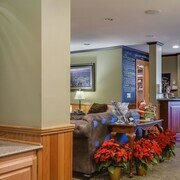 What other types of accommodations are available in Mount Vernon? Explore Mount Vernon with Expedia.ca’s Travel Guides to find the best flights, cars, holiday packages and more!